Deb's Cup of Tea: Absolutely, totally 100% Legit. Occasionally, stuff comes through the fax machine that, well, makes us all laugh. I guess this scam must still work. If I even believed this guy was related to Charles Taylor and that there was money stored in a bank account, I think there are laws about helping people with ill-gotten gains transfer money around the world. 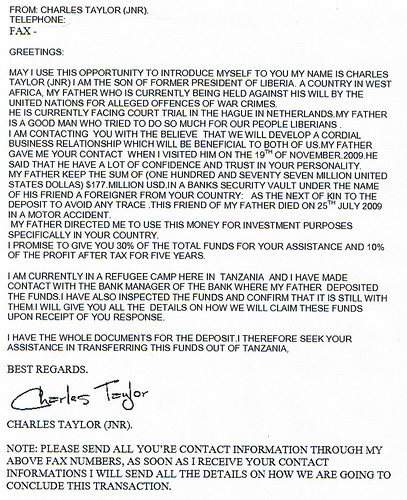 I know of Charles Taylor of Liberia. If I remember correctly, he devastated the economy of that nation and is under arrest for war crimes. Helping him would probably land you in very hot water. The other thing that strikes me is "I am currently in a refugee camp here in Tanzania..." That's some refugee camp that has a fax machine which can call US numbers. So, we all got a laugh and I knew I had to share with my readers. The letter is now in the recycling bin.